From Stringer Bell, to Luther, to whatever the name of his character in Pacific Rim was, Idris Elba is brilliant at playing charismatic, dangerous individuals. 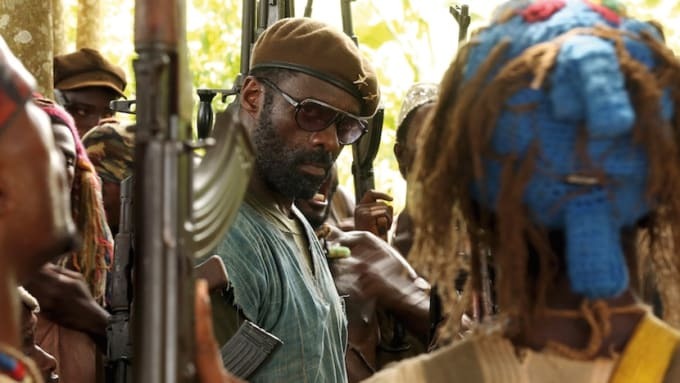 Yet his role in Beasts Of No Nation might be the most intense thing he’s ever done. It’s important to stress though, that despite the fact Elba’s name will be at the top of all the posters, he only really plays a supporting role in the film. Beasts Of No Nations belongs to14-year-old Ghanaian newcomer Abraham Attah, who stars as Agu, a kid dragged into the horrific world of child soldiers. The film opens with Agu living with his family in an unnamed West African country. Despite their poverty, it’s portrayed as an almost idyllic childhood. Almost too idyllic if I’m honest—these early scenes are pure Hollywood and too sentimental really, though they do go to underline the horrors that are to follow.